There are those looking to get rid of Jesus. In cleansing the Temple, Jesus has pronounced God's judgment upon it. For the religious leadership this was the final straw. They now look for a way to kill him, but given that the Passover is upon them, they need to exercise caution; messianic fervor and national pride is running high, and the last thing the chief priests and the teachers of the law want is an uprising that will result in a Roman crackdown. As Jesus gathered for the Passover meal with his disciples and others, emotions and spirits were no doubt conflicted. The joy of the Passover celebration was tempered by the rising tensions swirling in the air around Jesus. 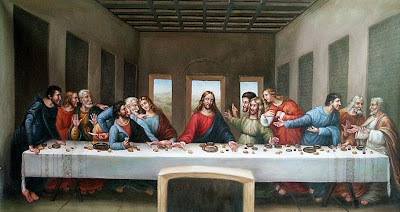 What joy there was was squelched when Jesus announced, "I tell you the truth, one of you will betray me—one who is eating with me." To be willing to have table fellowship with one you know you are about to turn in is an egregious breach of hospitality customs in the first century Jewish world. It is bad enough to betray Jesus, but for the betrayer to sit at the table with Jesus in "friendship" is dastardly to say the least. Before the meal ends, Jesus will take the Passover meal and its centuries old ritual, and transform it into something that will echoes through the centuries in a uniquely Christian way. Betrayal is not the only thing on the mind of Jesus; denial is close at hand as well. Simon Peter, whose verbal bravado throughout the Gospels is louder and more courageous than his follow-through, insists that he will go to the death for Jesus. The other disciples, in like fashion, promise the same. How disheartening it must have been for Jesus to know that in the last hours of his life, the men he spent most of his waking moments with would abandon him in his greatest hour of need. Moreover, the disciples' desertion would be made all the worse in their inability to stay awake in the Garden of Gethsemane. Surely by now they know that things have become quite serious, and that the climactic moment is at hand; and yet, while Jesus prays in torment, Peter, James, and John cannot even keep their eyes open. As Jesus is arrested, one attempts to defend him cutting off the ear of the servant of the high priest. Jesus rejects such a response. He has refused throughout his ministry to lead a violent revolt, and he will not resort to it now even when threatened. Perhaps for the disciples, this is the final confirmation for them that Jesus will not be the kind of Messiah they desire. Perhaps, for them, running for their lives so that they might live and fight another day with another Anointed One, makes perfect sense. Here Jesus rejects, for one final time, what the disciples have desperately wanted him to do; here is where he can take his stand against Rome. He does not. As Jesus stands before the Sanhedrin, the religious ruling council, the outcome of the trial has already been decided before it is over, and Jesus' response ensures the outcome the high priest desires. They begin to strike him and make fun of him, no doubt a painful affair for Jesus; but even more painful for him is what is happening out in the courtyard while Jesus is being beaten. Jesus' words to Peter are coming true as his number one disciple not only denies him three times, but swears a divine oath in affirmation of his ignorance, not only lying to those around him, but doing so in the name of the One is truth. The rooster crows a final time and Peter responds in the only way appropriate for such profane perjury; he breaks down and sobs inconsolably.